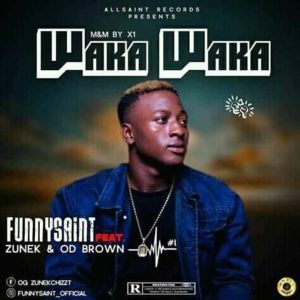 Ebonyi fast raising actor/ singer FUNNYSAINT, finally opens the year with a dope jam titled Waka Waka featuring ZUNEK a Lagos born star and OD BROWN AFROLORD. Bigger boss …am happy 4 u bro . More grace ..more hit ,,more inspiration ,,,excess connection ….go on bro oluwa gat ur back . This is suprising and luring making the Lord of pop rising and echoeing , keep the pop moving we call to posses some feature which we are after, thanks from willynilly .